US Air Force and Navy jointly conducted the J-UCAS under DARPA and both Boeing and Northrop Grumman developed prototype ucavs, the X-45A and X-47A respectively. J-UCAS was canceled under the weight of too many objectives and the US Navy contracted Northrop under the new UCAS-D program that lead to the X-47B. 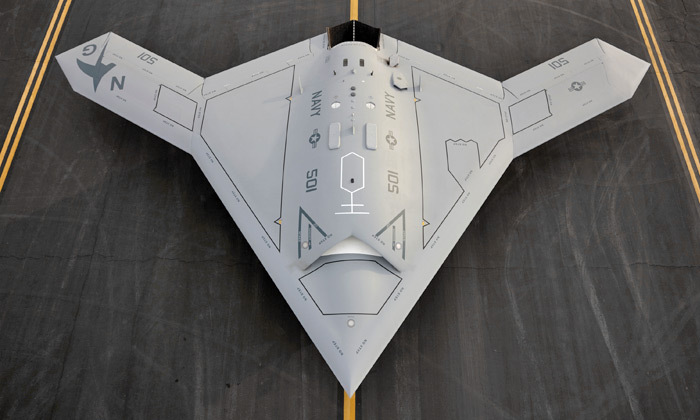 The –B version shares almost nothing with the original and smaller X-47A. It is a cranked-kite flying wing, where the outer wings have less sweep than the blended fuselage. This design allows for more internal volume and more favorable low speed handling without sacrificing stealth. Low observability is a key aspect of X-47B, it will have all aspect and broadband stealth and being a tailless flying wing it is inherently stealthier than any conventional aircraft (ex F-22/F-35) in the same technology level. It use a derivative of Pratt&Whitney F100 (-PW-220U) that powers most F-15 and F-16s without the after burner. This engine isn’t used by the Navy and it is modified for operations in a maritime environment. If the UCAS-D program leads to a production aircraft it will probably use another engine, most possibly the F-135 that will by then be operational with the F-35. The landing gear is slightly over-engineered to compensate for carrier touch down and catapult. If as expected the X-47B is accurate enough it will be replaced by a lighter more compact arrangement. Like most flying wings it uses split ailerons (rudderons) for yaw control. The use of UCAVS is nothing new. Almost 10 years ago in 2002 a MQ-1B fired a Hellfire mission and became the first UAV to perform such an attack. Today many UCAVs around the world perform for better or worse similar missions routinely. However the X-47B will push the envelope even further. It will introduce all aspect stealth and high subsonic speed and it will be able to operate autonomously from an aircraft carrier, a very difficult task that demands extremely accurate and dependable capabilities. Northrop took a risk funding the X-47A internally for the J-UCAS and now Boeing continues to develop the X-45C ‘Phantom Ray’ a derivative of the J-UCAS X-45A. Both X–45 / X-47 are similar and although only the X-47B is currently funded a production version is still open. Another interesting aspect is the relation of these UCAS to the still classified and possibly funded under the black budget Next Generation Bomber for the USAF. This will complement or even replace the B-2 fleet and will be cheaper, more efficient and more versatile. 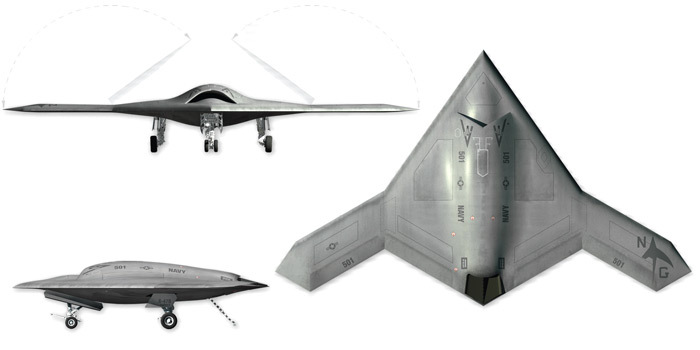 The concepts from Northrop Grumman and Boeing are similar to those UCAVS. A proposed bigger X-47C variant for the USAF, will have the exact wingspan of a B-2 and it is possible that the NGB will be optionally manned, unifying a big UCAV and manned bomber under the same project. Around 50 flights are scheduled for 2011 in Edwards AFB and afterwards the X-47B will go to Naval Air Station Patuxent River. In 2013 a surrogate F/A-18 will conduct tests by using the X-47B software before the actual tests. These test flights will validate the airworthiness and the carrier integration; the next stage is the development of the X-47B as a system. A second aircraft will join the tests soon and it is also scheduled for aerial refueling.